While the vast majority of fish give no parental care to their young, considerable diversity exists among those that do. Several groups of fish use a breeding strategy called mouth-brooding. Mouthbreeders carry their eggs, and later their young, in their mouths. This allows the adults to protect their eggs. You can usually tell that fish are mouth-brooding several ways. Mouth-brooding appears to have evolved independently across a number of unrelated fish. 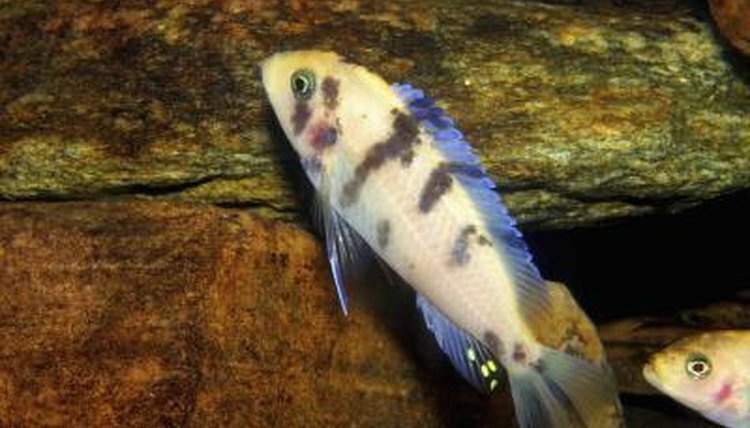 In freshwater, the cichlid, betta and catfish families all have some members that employ this strategy. This behavior also appears in some saltwater fish, including jaw fish and cardinal fish. In some species, the male carries the eggs. In others, the female takes on the responsibility. You have to know the standard for your particular species in order to know if one is incubating eggs. In some species of mouthbreeders, mating is a conspicuous affair. For example, the mouth-brooding bettas and cichlids typically have elaborate mating dances and make a day of it. However, not all mouthbreeders put on such a show. Often with cardinal fish, you may not see any breeding but suddenly notice other signs that fish have spawned. Again, know what's normal for your fish in order to know what to look for. In many fish, the most reliable sign that a mouth-brooding fish has spawned is a swollen mouth. Specifically, the throat region distends to accommodate the eggs. This puffed-out throat forms what scientists call a buccal pouch. In fish like cardinal fish, which may spawn at night or otherwise out of sight, this may be the first sign that fish have spawned. If you observe your fish daily, the distention will be noticeable. A healthy fish will rarely refuse food. However, mouthbreeders will usually give up food for the duration of the incubation. For this reason, most mouthbreeders need to be conditioned -- frequently fed nutritious foods -- for several weeks prior to spawning. This gives them fat reserves to live off while they raise their young. Keep in mind that refusing food can be a sign of disease, so make sure you rule out health problems before you assume a fish has spawned. How Do Mom Fish Have Babies?